Tracheal stenosis is a life-threatening condition characterized by abnormal narrowing of airway passageways leading to restriction of pulmonary ventilation. The stenosis may result from extrinsic compression or intrinsic narrowing resulting from variety of benign and malignant causes. The intrinsic narrowing can be further classified into glottic, subglottic and at carina, or bronchi according to the level of stenosis. Endotracheal tuberculosis, sequelae of pulmonary tuberculosis that extends to endotracheal wall causes inflammation, edema, ulceration, granulation, or fibrosis of mucosa and submucosa is among one of causes of subglottic stenosis. We report airway management of a tracheostomized patient with subglottic stenosis in stridor. A 33-year-old female presented to us for preanesthetic check-up for tracheal dilatation and stenting. Patient was apparently alright 2 years back when she developed shortness of breath with hoarseness of voice. She underwent evaluation for tuberculosis. Sputum smear examination was found to be positive for acid fast bacilli (AFB). She took antitubercular treatment but shortness of breath persisted. In view of increased respiratory distress, emergency tracheostomy was performed. On fibreoptic evaluation of upper airway, the patient was found to have subglottic stenosis. Later, stenosis was managed with laser surgery followed by serial dilatation. Tracheostomy tube was repositioned and changed with adjustable flange. However, complain of respiratory distress with stridor was persistent. Fibreoptic bronchoscopic view obtained under sedation was suggestive of edematous carina and lower end of tracheostomy tube was seen upto carina. It was planned to dilate the tracheal stenosis followed by stenting under general anesthesia. 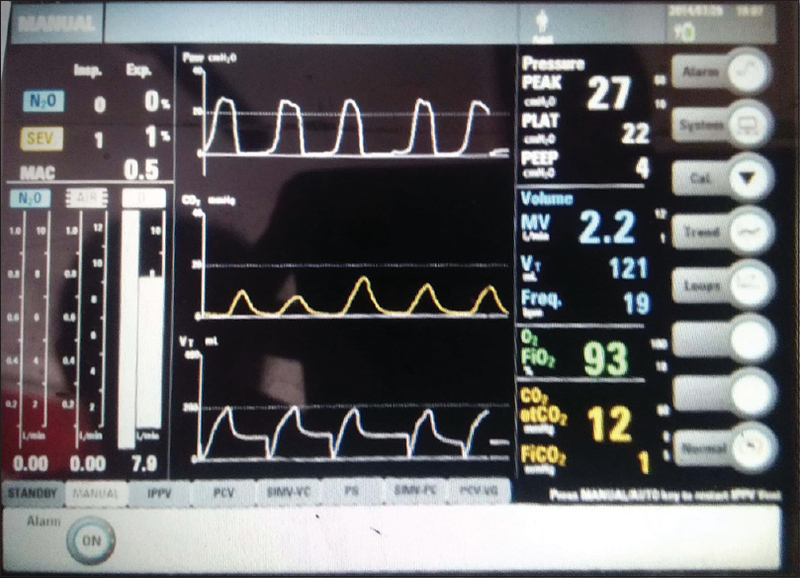 Various techniques including apnoeic oxygenation, spontaneous-assisted ventilation, controlled ventilation manual jet ventilation, and high-frequency jet ventilation have been already described in literature for ventilation during rigid bronchoscopy. Preanaesthetic check-up and routine investigations were within normal limits. Patient was kept fasting as per guidelines of no solids by mouth for 8 hours and was allowed to drink clear liquids up to 2 hours prior to the procedure. Patient was premedicated with injection glycopyrrolate 0.1 mg i.v. Anesthesia was induced with injection propofol 1 mg/kg titrated to loss of verbal commands. After confirmation of ventilation, neuromuscular relaxation was achieved with injection vecuronium 0.1 mg/kg. Anesthesia was maintained with sevoflurane in mixture of 50% O2 in air. Tracheal dilatation was achieved with rigid bronchoscope. It was decided to introduce rigid bronchoscope further for evaluating lower airway and proceed with stenting. For executing planned procedure, removal of tracheostomy tube, and provision of apnoeic ventilation were required. The clinical scenario was perplexed by the fact that if airway collapses after removal of tracheostomy tube, then introduction of both rigid bronchoscope and tracheostomy tube will be impossible. 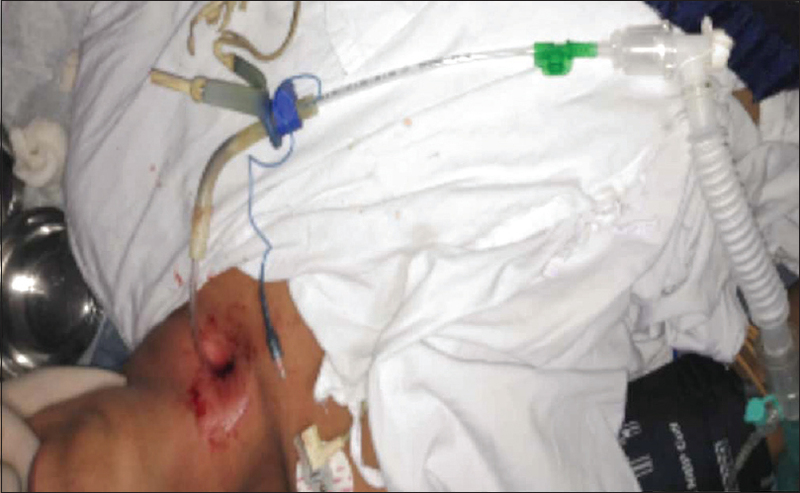 Further, patient complained of stridor despite tracheostomy tube in situ preoperatively. These circumstances left us in clinical dilemma whether to remove tracheostomy tube without immediate cardiopulmonary bypass backup. Tracheal insufflations of oxygen with a suction catheter was planned, but with slight modification. This suction catheter was connected to endotracheal tube connector which in turn was connected to closed circuit of machine [Figure 1]. With this modification, we were able to ventilate patient with approximately 150 ml of tidal volume [Figure 2]. Now, another concern was, if we removed the tracheostomy tube, whether we would be able to reinsert it when required. Here, suction catheter came to rescue as we removed tracheostomy tube over suction catheter where catheter could again be used to rail road the tube. Tracheostomy tube was then removed from stoma, with suction catheter inside. Rest of evaluation of lower airway took approximately 30 minutes. During this period, ventilation was performed with ventilation through suction catheter uneventfully. Alas! Due to severe edema and involvement of long length of airway, stenting including both tracheal and bronchial segments was planned for further management. At the end, bronchoscope was withdrawn and tracheostomy tube was rail roaded. Position of tracheostomy tube was confirmed with fibreoptic bronchoscope and square wave capnograph. Neuromuscular blockade was reversed with injection neostigmine 50 μg/kg in combination with injection glycopyrrolate 10 μg/kg. Hence, with quick, rational decision and application of knowledge about modifications that we routinely do in our day to day practice, we were successfully able to manage airway in this patient. Cary C, Jhaji M, Cinicola J, Evans R, Cheriyath P, Gorrepati VS. A rare case of fibrostenotic endobronchial tuberculosis of trachea. Ann Med Surg (Lond) 2015;4:479-82. Daniel N, Todd WS. Rigid Bronchoscopy- Indications and techniques. Oper Tech Thorac Cardiovasc Surg 2012;17:44-51. Vikas P, Ian W, Kamran M, Momen W, Neil M, Shofer S. Focussed reviews. Ventilation and anaesthetic approach for rigid bronchoscopy. Ann Am Thorac Soc 2014;11:628-34.